Silicosis is a major occupational lung disease with a relatively fatal and irreversible outcome. Early diagnosis for shifting the potential candidates to safe modes of workplace as well as for prevention of further progression is the cornerstone of management. 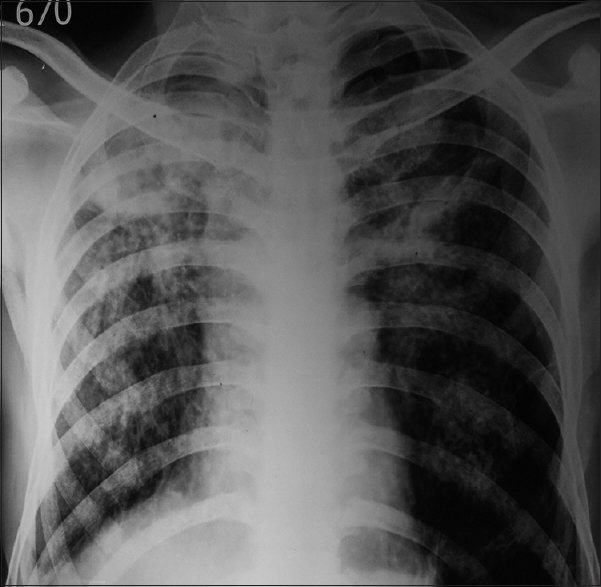 Here, we present a complicated case of silicosis in the form of progressive massive fibrosis, which was initially interpreted as tuberculosis; radiological images had resemblance with tuberculosis and cryptogenic organizing pneumonia. Radiology-guided trucut biopsy was imperative to confirm the diagnosis. A 52-year-old male patient, farmer by occupation, presented to our tertiary care hospital with dry cough for 3 years and gradually progressive shortness of breath for 1 year. His illness started 3 years ago with insidious onset of dry cough. 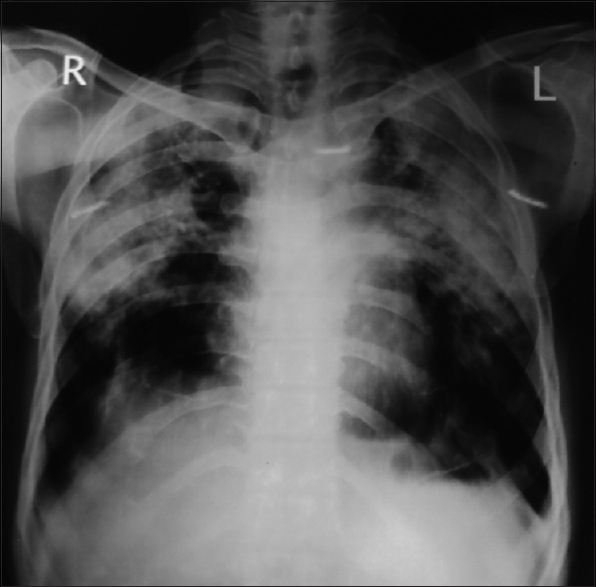 He was treated with antitubercular drug (ATD) from RNTCP as sputum negative pulmonary tuberculosis based on radiological diagnosis [Figure 1], but his cough persisted. Since the last 1 year he had experienced dyspnea, which was initially MMRC grade 1, but progressed over the next few months to become MMRC grade 3 at the time of presentation to us. There was no history of fever, hemoptysis, chest pain, joint pain, skin rash, and wheeze; there was no history suggestive of orhopnea and paroxysomal nocturnal dyspnea during the entire course of the illness. He was put on retreatment regimen of ATD (category-II) from RNTCP based on chest X-ray [Figure 2], however, his symptoms persisted even after the completion of ATD, as well as the deterioration of the radiological picture [Figure 3] even at the end of category-II ATD. Hence, he was referred to us. He was a smoker (with 21 pack years of bidi) without any other addiction. On examination, patient had tachypnea (respiratory rate 32/min), tachycardia, engorged and pulsatile internal jugular vein, and oxygen saturation at rest of 92% in room air. There was no clubbing, no peripheral lymphadenopathy, and no other significant finding on general survey. Systemic examination revealed bilateral end-inspiratory crepitations in infrascapular and infraaxillary areas (velcro) with a loud pulmonary component of second heart sound (loud P2) with closed split and left parasternal heave. 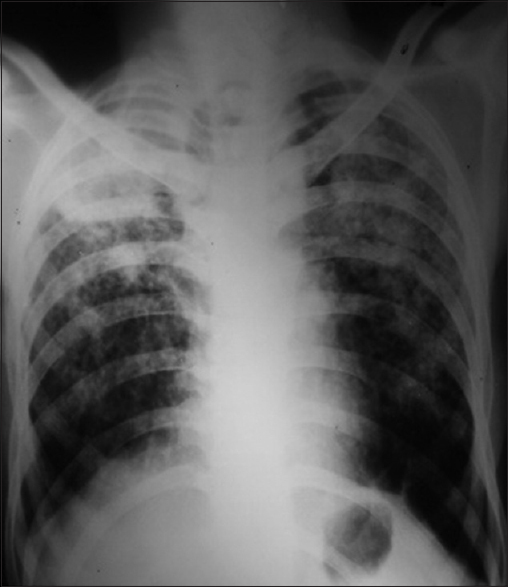 Current chest radiography [Figure 4] showed bilateral reticulonodular opacities, coalescence of nodular shadows, obscuration of vascular markings, and bilateral volume loss indicating ongoing fibrosis. 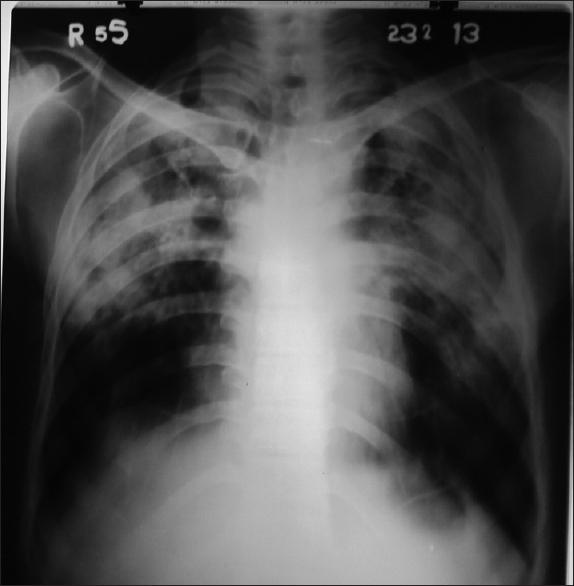 Comparison of current chest X-ray [Figure 4] with the previous one [Figure 3] showed no radiological improvement over the last 6 months despite taking two courses of ATD from RNTCP. His sputum sample was negative for Mycobacteria on both smears by Ziehl-Nielsen method and culture by BACTEC method. Mantoux test was negative with 5 TU PPD. Spirometry revealed restrictive pattern. Contrast-enhanced computed tomography (CT) thorax [Figure 5] revealed bilateral reticulonodular opacities with areas of consolidation and mediastinal lymphadenopathy, whereas conglomeration of multiple homogenous opacities on both sides appearing as confluent and consolidated mass lesion, which was indicative of progressive massive fibrosis. As possibility of tuberculosis was ruled out by repeated negative sputum acid-fast bacilli results and progression of disease despite two courses of ATD, other possible diagnosis were (1) silicosis with progressive massive fibrosis and (2) cryptogenic organizing pneumonia. Keeping this in mind, we again thoroughly enquired and found that he had worked in a stone crushing factory in a poorly ventilated confined space without any protective appliances for 8 years, but left the job 15 years back. There was history of many of his colleagues developing similar respiratory difficulties and few even succumbing to death within few years. We performed fibreoptic bronchoscopy (FOB) to rule out other possible disease. Bronchoalveolar lavage (BAL) fluid cellular pattern was normal and yielded no fungal or pyogenic organisms. Mycobacterial culture from BAL fluid yielded no growth. For histological confirmation, we performed a CT-guided trucut biopsy from parenchymal consolidation, which showed interstitial fibrosis composed of fibrocollagenous tissue with focal areas of hyalinization, fibroblastic proliferation, and densely infiltration by pigment containing macrophages. 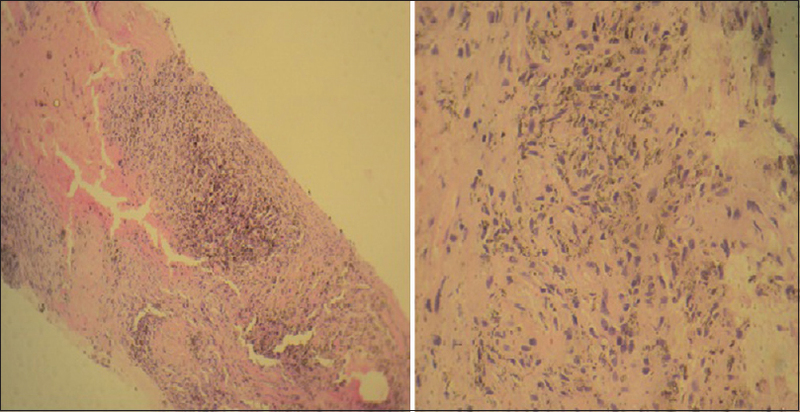 The histological features [Figure 6] were suggestive of diffuse parenchymal lung disease (DPLD). Keeping in mind cryptogenic organizing pneumonia along with silicosis with progressive massive fibrosis as a possible diagnosis we started corticosteroids 50 mg/day, however, there was no improvement either clinically or radiologically even after 3 months of treatment that rendered the diagnosis of cryptogenic organizing pneumonia unlikely. Hence, our final diagnosis was silicosis with progressive massive fibrosis. Subsequently, the patient was prescribed domiciliary oxygen, diuretic for controlling pulmonary hypertension, along with inhaled short acting beta2 agonist for symptomatic management. At present, he is clinically stable and under regular follow-up at our chest outpatient department. Silicosis has a relatively long latency period, and three different patterns of silicosis have been recognized, i.e., chronic, accelerated, and acute forms, primarily based upon the degree and duration of exposure and onset of symptoms. The most common presentation is in the form of uncomplicated chronic silicosis as in our case. It usually develops only after decades of repeated exposure to high concentrations of silica dust and generally remains asymptomatic even when the radiographic appearance suggests fairly advanced disease in the form of fibrosis. Our case was initially misinterpreted as tuberculosis, which ultimately proved to be silicosis in the form of progressive massive fibrosis. This is a learning point for us in our country where occupational hazard is a well-recognized entity. Because it is a relatively irreversible form of fatal disease, henceforth, practicing good occupational hygiene including substitution by safer materials, removal of dust at the source, strict dust suppression control measures, clean air supply to the operatives by the respirators and air stream helmet, and proper use of disposable filtering face masks should be practiced uniformly in a developing country like India, especially in high risk industries. International Labour Office: Encyclopedia of Occupational Health and Safety. 4 th ed. Geneva: International Labour Office; 1998. Ziskind M, Jones RN, Weill H. Silicosis. Am Rev Respir Dis 1976;113:643-65. Indian labour statistics-1994. New Delhi: Labour bureau, Ministry of labour; 1996. Vallyathan V, Shi XL, Dalal NS, Irr W, Castranova V. Generation of free radicals from freshly fractured silica dust. Am Rev Respir Dis 1988;138:1213-9. Greenberg MI, Waksman J, Curtis J. Silicosis: A review. Dis Mon 2007;53;394-416. Natarajan AS, Gajalakshmi L, Karunakaran S. Accelerated silicosis in a silica flour mill worker. Lung India 1992;1:33-7.
International Labour Office Encyclopedia of Occupational health and safety. Vol. 1 and 2 Silicosis and Silicotuberculosis. 3 rd ed.. Geveva; 1983. Robert G, Fraser P, Pare JA, Pare PD, Richard D, Fraser S, et al. Diagnostics of the diseases of the chest. 3 rd ed. Vol. 3. Philadelphia: WB Saunders company; 1990. P. 2282-301. Seaton A, Gordon A, Leitch. Crofton and Douglas's Respiratory Diseases. 4 th ed.. Delhi: Oxford University Press; 1989. p. 350. Becklake MR. Pneumoconiosis. In: Murray N, editor. Textbook of Respiratory Medicine. Philadelphia: WB Saunders Co; 1988. p. 1567. Snider DE Jr. The relationship between tuberculosis and silicosis. Am Rev Respir Dis 1978;118:455-60.